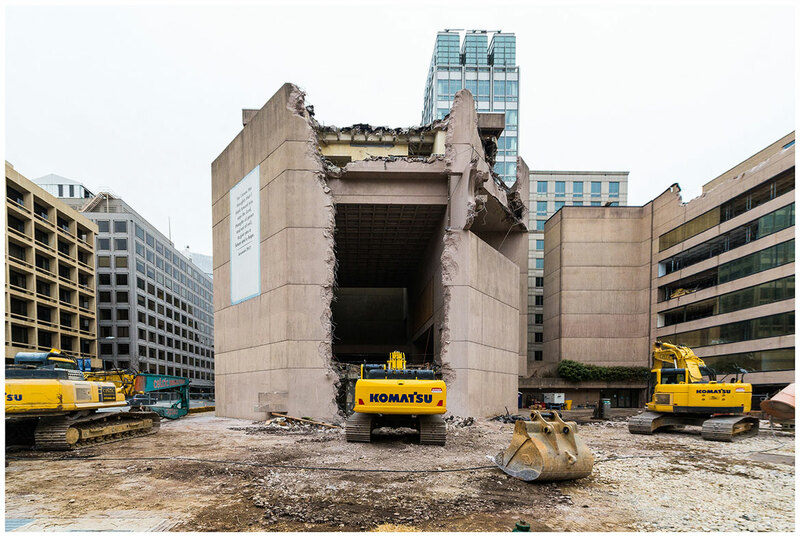 The dire threat to mid-20th century monumental concrete architecture—generally known as “brutalism”—is demonstrated in “Brutal Destruction,” an exhibit opening next week of photos documenting the demolition and alteration of the buildings across the United States and in Britain. “We have the problems of these buildings being considered ugly and eyesores and everything else. Which is changing. 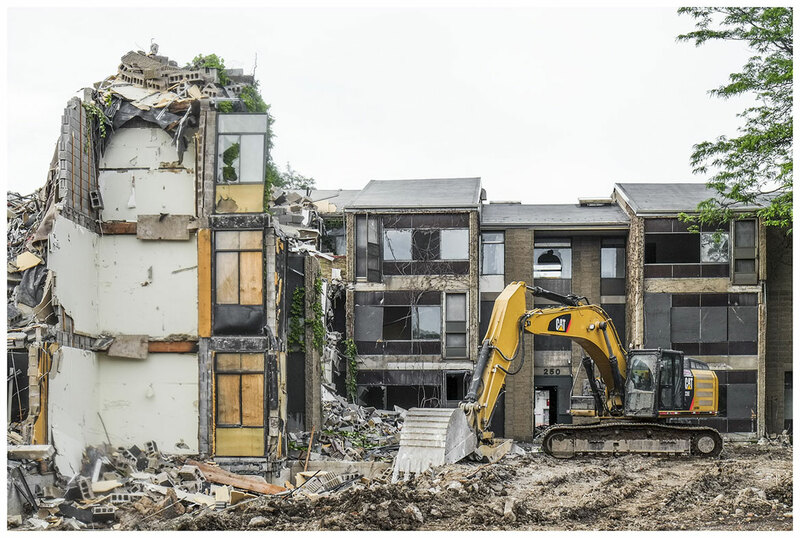 But while it’s changing, they’re being rapidly erased from cities and other places,” says Chris Grimley, a champion of the style and preservationist who organized the exhibit at Boston’s pinkcomma gallery, where it will be on view from April 12 (reception from 6 to 8 p.m.) to May 3. David Torke: Shoreline Apartments, Buffalo. 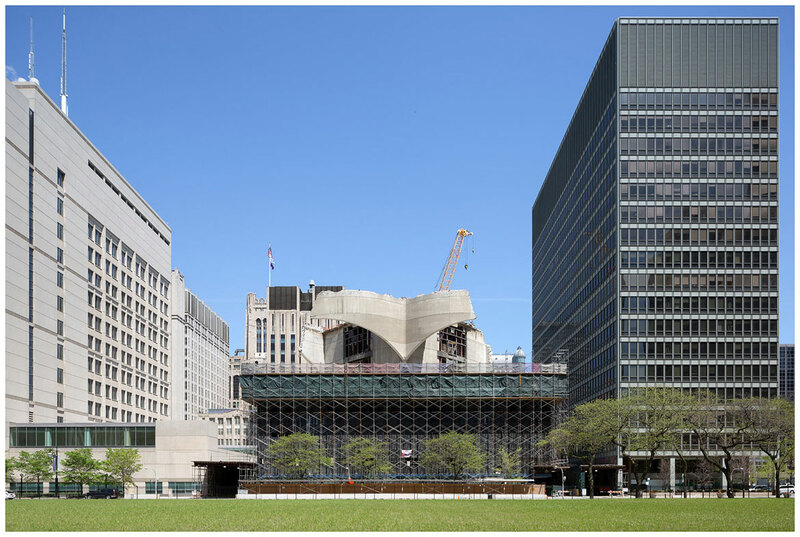 For proponents, this monumental concrete modernist architecture was seen as symbolic of a new, robust culture rising from the ruins of the Great Depression and World War II, of the power and daring of big government, of a new civic spirit to improve lives. Highlighting the construction materials and their structural strength was heralded as a form of honesty. The term brutalism derives (at least in part) from the French “béton brut,” meaning raw concrete, but carries connotations of “brutal,” which is how many unfavorably view the structures. 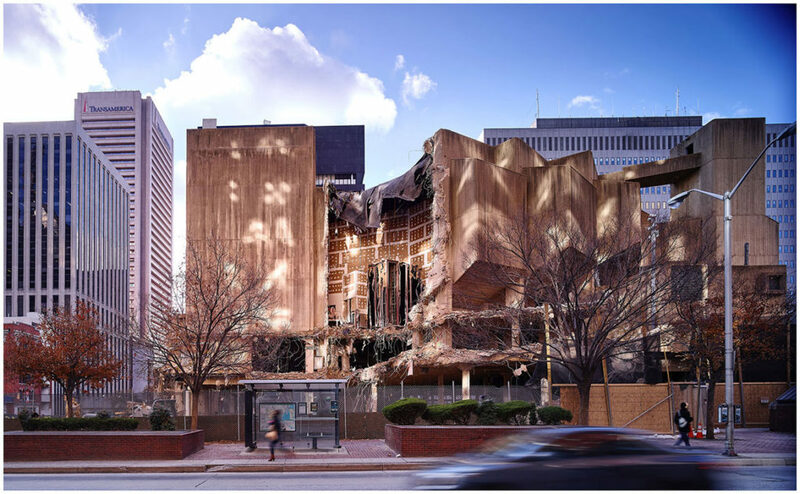 As a result, brutalist buildings have often been poorly maintained and become targets for demolition. The exhibit features photos by Matthew Carbone of the Mechanic Theatre in Baltimore; by Harlan Erskine of Orange County Government Center in Goshen, New York; by Jason Hood of Birmingham Public Library in Britain; by Rey Lopez of Third Church of Christ in Washington, D.C.; by David Schalliol of Prentice Women’s Hospital in Chicago; by David Torke of Shoreline Apartments in Buffalo; and by Oliver Wainwright of Robin Hood Gardens in Britain. The most famous (notorious?) local example of this architecture is Boston City Hall—a “perennial punching bag,” as Grimley notes. In 2013, when Marty Walsh was first running to be mayor of Boston he called for selling off the building so that the site could be privately redeveloped. He’s since backed away from the proposal. But widespread dislike of the building and its surrounding plaza continually leave its future in question. Help Wonderland keep producing our great coverage of local arts, cultures and activisms by contributing to Wonderland on Patreon. And sign up for our free, weekly newsletter so that you don’t miss any of our reporting. Matthew Carbone: Mechanic Theatre, Baltimore. 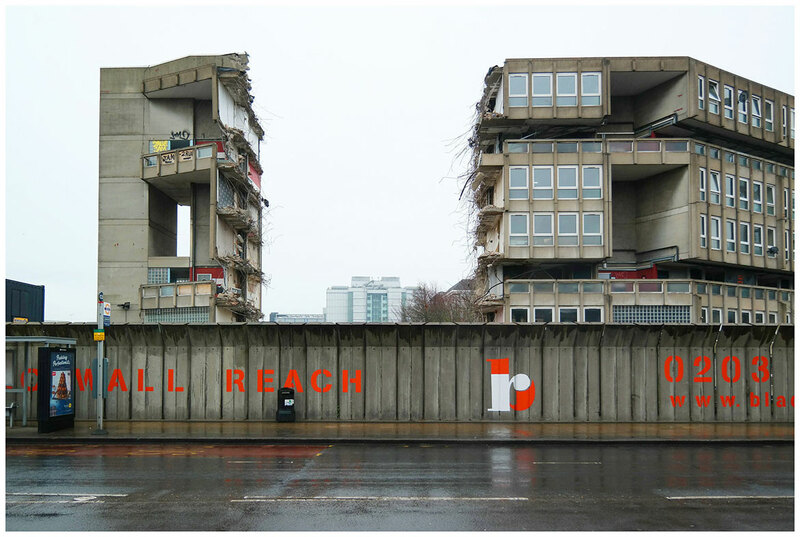 Oliver Wainwright: Robin Hood Gardens, U.K.
David Schalliol: Prentice Women’s Hospital, Chicago.